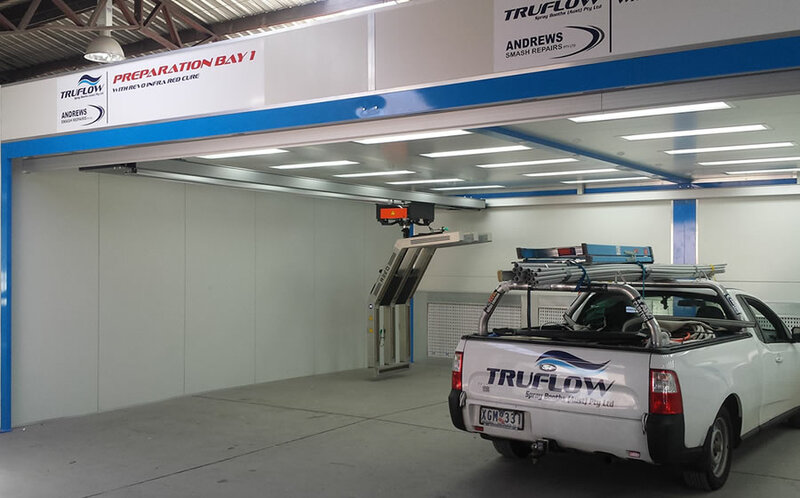 Truflow Spray Booth’s range of Preparation Systems include Quick Repair Booths, Preparation Bays, Prep Areas and Extraction Walls. All of which are designed to suit a large variety of configurations. This segment of the website shows the Automotive range of preparation bay options. If you are looking for an industrial based application preparation area you may wish to look at our Industrial Preparation Booths page or the Aviation & Aerospace Preparation Bays page. 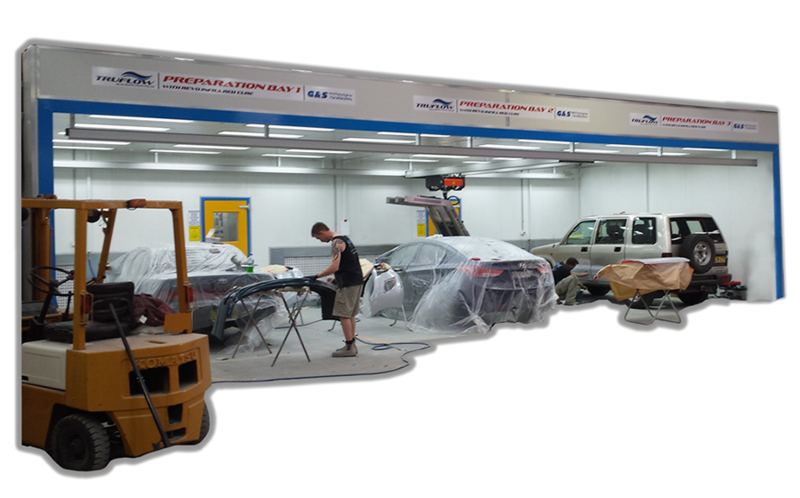 The preparation bays main aim is to stop the bottleneck at the paint booth by substituting the preparation bay as the main location for priming or smaller paint spotting works prior to occupying the Downdraft Spraybooth. Of course the preparation bay will also reduce workshop dust and ensure operator safety. Truflow’s range of Preparation Areas are available for any product application, any industry and any budget. Automotive Preparation Bays can consist of something as simple as a Rear Extraction Wall or can be fitted with a complete Cabin including lighting, side walls and a roof. The exhaust is typically mounted in the rear wall with dust & paint capture filters. A separation curtain is ideal if the zones are to be segmented and dust extraction arms or service stations can be fitted to the prep bays where required. While Full Downdraft type preparation bays are also used paticulary in higher volume shops but these are commonly refereed to as Rapid Repair Bays. 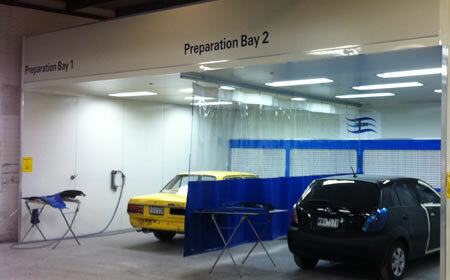 Automotive Preparation Bays are suitable for Sanding and Preparation of vehicles or parts or dust extraction. They are also commonly used for Paint Spotting of parts still fitted to vehicles and of course priming / undercoating with the use of an infra red arch or rail system. In today’s modern body-shop it is common practice to repair, prime and even top coating in some applications within a preparation bay. 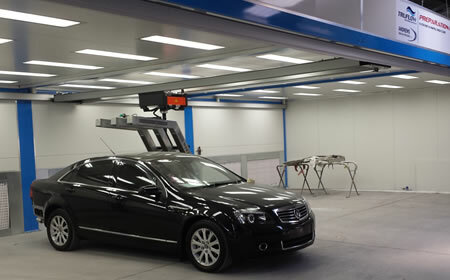 An ideal solution for any modern bodyshop. Designed to suit the facility, TRUFLOW Engineers will measure and fit a preparation bay to suit your factory, size and requirements. A separation curtain installed within a prep bay provides a great level flexibility to users by allowing the space to be split or combined depending upon the repair. Key benefit: Provides user with a flexible and segmented workspace. Limits cross contamination. A single infra red can be installed over a multi car preparation bay allowing for the infra red to be shared by multiple users throughout the repair process. This is excellent use of a key asset in your workshop, by splitting the usage of your infra red over three bays you are getting the best value for money return on your infra-red system. Key benefit: Allows multiple users to share a single infra red asset across the line maximizing the assets operational time and return on investment. Single or multiple bay downdraught preparation areas are commonly used for quick repairs and rapid repair systems. Complete with dust extraction systems, shelving and tool storage the full downdraught preparation bays are ideal for high volume small repairs in a clean environment. Internal scissor lifts can be fitted to provide operators with a height adjustable platform. Key benefit: Direct Downdraft airflow allowing for clean, high volume repairs. 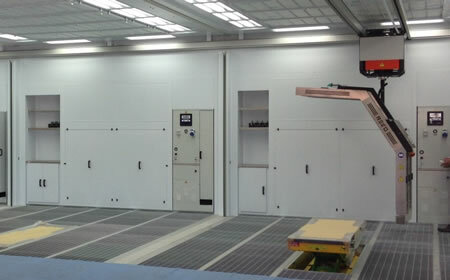 Large range of options and designs to suit specific workshop sizes, paint types and applications.